The human race has an energy problem. Despite continually increasing demand, we still have no truly viable way to produce energy on a necessary scale without significant environmental consequences. So what about solar, wind, hydro, nuclear, geothermal, or CCS (carbon capture and storage)? Each of these generation methods has its own disadvantages, and certainly none can realistically meet global energy demands alone. Wind and solar suffer from serious reliability problems (no-one wants their ability to light their home to depend on the weather) as well as requiring large areas of land to generate significant power, an important consideration giving a growing population. Nuclear fission power is more reliable, requires little land and could meet our base-load generation needs, but it is far from perfect. In addition to limited fuel availability, the waste leftover from fission reactions is very dangerous and very difficult to process; we still have no reasonable method for doing this. I would like to address another possibility – fusion energy. A fusion power plant could run entirely on material found in seawater (heavy hydrogen and lithium), using only half a ton of fuel per year for a 1 GW reactor (1 GW is the size a large coal or nuclear plant, enough to power 750,000 to one million homes). The only waste generated is helium, a reactor could run 24 hours a day, and it would be inherently safe without any possibility of catastrophic meltdown. However, there is a well known catch, and it is a rather serious one – building a fusion reactor is exceptionally difficult. Nonetheless, scientists and engineers have made enormous progress in the past 50 years. We are now ready to take the final steps and run experiments that produce more energy than they consume, paving the way to commercial power generation later in the century. The basic idea of fusion power is very simple. The mass of a Helium nucleus is about 1% less than the sum of the masses of its constituent parts (two protons and two neutrons). So what happens if we create a Helium nucleus by fusing smaller nuclei – in particular two Hydrogens – where does this mass go? The answer is that it is converted directly into energy, in prodigious quantities. While 1% may not sound like very much, Einstein’s famous formula E=mc2 tells us that 1 kg of matter would become 9×1016 J of energy – this is enough energy to power New York City for more than a month! Of course, we cannot simply hold some hydrogen in a tank and hope that it will undergo fusion, the problem being that hydrogen nuclei are charged and have a very strong mutual repulsion. If we hope to extract power from fusion, the gas of hydrogen must be made incredibly hot or incredibly dense, and then somehow contained to extract the energy. This is where the difficulty of fusion energy comes in. There is no material with properties that are even close to what is required to hold a gas undergoing fusion, not to mention the obstacles involved with heating or compressing the gas to the necessary conditions. Nature has come up with a wonderful solution to this problem; all stars, including our sun, are powered by fusion reactions that are held together (confined) by gravity. Once a sufficient quantity of matter collects, the pressures and temperatures inside become so extreme that fusion occurs without any outside help. Obviously, using gravity to achieve these conditions is not practical on earth and we must seek alternative means. There are currently two main thrusts of fusion research that differ in how fuel is forced together. One idea, known as inertial confinement fusion, involves compressing the matter so fast and violently that it need not be continuously held together, instead producing energy through a series of miniature explosions. The largest experiment of this type is the National Ignition Facility, which uses the largest lasers in the world to compress hydrogen pellets to 1,000 times the density of typical solid solids (e.g. rocks or metals). The other approach, which is the focus of this article, is magnetic confinement fusion. Here, magnetic fields are used as the “bottle” to contain hydrogen, allowing the gas to be heated to temperatures many orders of magnitude higher than would be possible with solid walls. However, the use of magnetic fields is hardly a panacea to all our woes; containing a gas in this way is often likened to holding a ball of jello using only rubber bands! When heated to enormous temperatures, the atoms in a gas bounce around so violently that they are ripped into their constituent ions and electrons. This new state of matter is called a plasma and its study is fundamental in the quest for fusion energy. Because the particles are strongly charged, plasma behaves very differently to a normal gas in many ways. Most importantly, the particles are prevented from moving across magnetic field lines, and instead rotate (gyrate) along the field in a helix-like pattern (see Fig. 1). This can be very useful; if we curve our magnetic field around in a circle, making a shape like a donut, then the particles will be contained within this volume without any need for walls. This is the principle behind the most well developed potential fusion device, the Tokamak (Fig. 2). External coils create a very strong magnetic field in the direction around the hole of the donut (toroidal direction), which creates the basic structure of our magnetic bottle. However, this is not enough to contain our plasma, since, without the donut being closed at the top and bottom, the plasma would quickly change state upon colliding with the cold solid walls above and below. 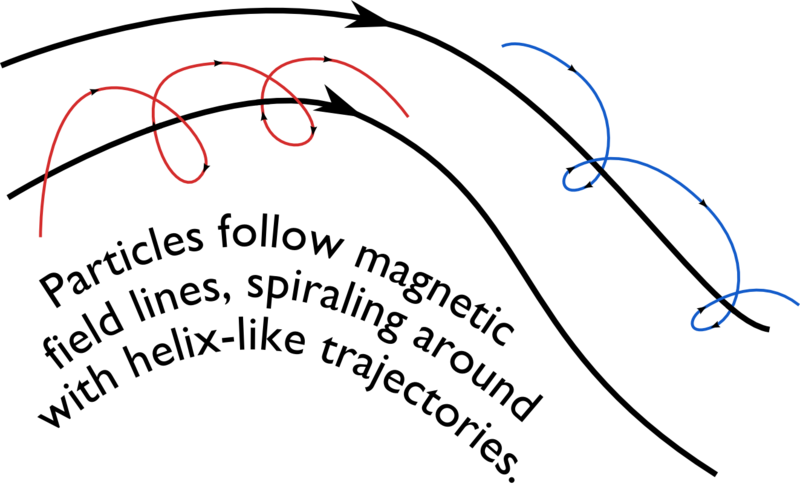 This problem is solved primarily by driving a current in the plasma itself in the direction around the donut hole (remember, the plasma particles are charged so a current can develop if electrons and ions are moving in opposite directions), causing the magnetic field to twist as it goes around (think a helix twisted end to end into a circle, as shown by the black arrow in Fig. 2). This vastly improves confinement, since particles now alternate between drifting up and down as they move from the inside to the outside of the donut. Once it is confined, we use high energy particle beams and radio waves to heat the plasma to temperatures high enough for fusion to occur – usually around 150 million degrees Centigrade! Electrons and ions (blue and red) gyrating around magnetic field lines (thick black lines). Since particles are strongly inhibited from moving across field lines, we can curve the field into a circle to create a magnetic bottle for our plasma. Cartoon of a tokamak, with the plasma shown in pink. The blue coils create the strong toroidal magnetic field, while the poloidal magnetic field (shown by the green arrows) is primarily created by a toroidal current in the plasma itself. Added together these create the twisted helical magnetic field shown by the black arrows. The transformer in the center is required to drive the plasma current and the poloidal field coils (shown in grey) are used for additional stabilization (source: http://www.efda.org). 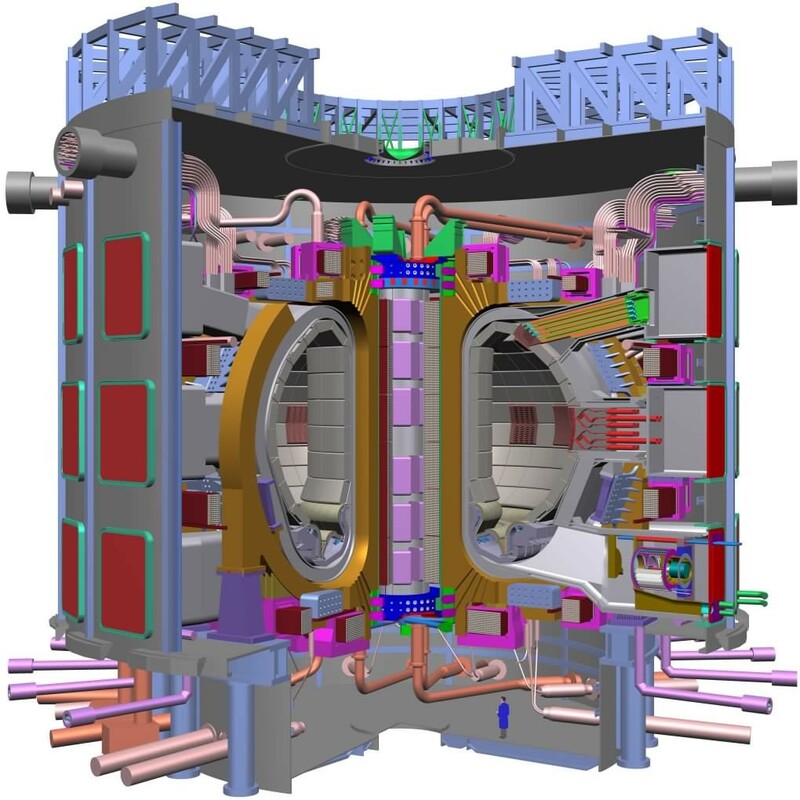 ITER is a multi-national project, currently under construction in Cadarche France, to build the world’s first fusion experiment that produces more energy than it consumes. 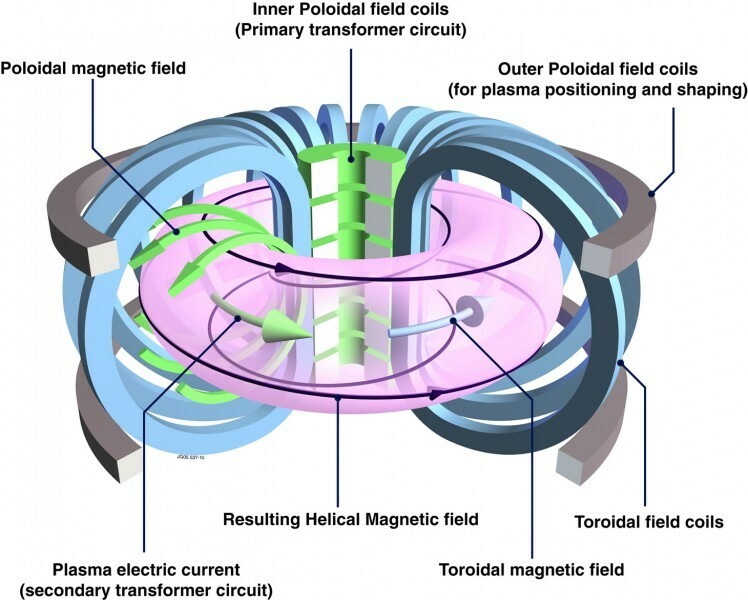 ITER will be a tokamak (see Fig. 3) much larger than any previous device: a weight of 23,000 tons, an azimuthal magnetic field of 12T, a plasma current of 50 million Amps, a pulse length of 500 seconds, with 500 MW of power produced by the fusion reaction. Why is ITER so large? The quick answer is that fusion devices need to be large so as to decrease the surface area to volume ratio. The plasma does not “like” to be confined (since confinement is strongly out of equilibrium) and it does everything it can to get back to a more stable state. In other words, our magnetic bottle is far from perfect and, to minimize the leakage, any viable tokamak reactor necessarily requires very strong magnetic fields and a very large volume. However, there are downsides to being large, mainly due to the enormous energy stored in the plasma. A potential unknown for the ITER project is the issue of disruptions, in which the plasma suddenly starts to change position uncontrollably. While not dangerous away from the device – the fusion reaction will be quenched as soon as the plasma touches the wall – disruptions could cause significant damage to the machine itself. As an example, a disruption at the Joint European Torus (currently the largest tokamak in the world), once lifted the entire multi-hundred-tonne machine several millimeters off the ground! Mitigating disruptions is a critical goal for ITER and will require marrying innovative control techniques to a thorough understanding of the physics of the plasma state. Cartoon of the ITER tokamak, note the person. Perhaps due to some rather bold claims made in the early days of fusion energy research, the field has earned itself a undesirable reputation among the general public as “always being 20 years away.” Nonetheless, enormous advances have been made over the last 50 years of research. In fact, by all reasonable measures, experimental fusion devices have been advancing faster than the well known “Moore’s law” of computer processors. Although significant challenges remain, we now have a thorough understanding of how to confine and heat plasma to the conditions necessary for fusion, but require money and effort for the push past the final barrier to a commercially viable reactor. With the necessary political will, as well as scientific advances in certain areas such as disruption mitigation, it seems likely that fusion energy will become a vital part of the world’s energy economy towards the second half of this century. Jonathan Squire is a 2010 fellow of the Fulbright Science & Technology Award program, from New Zealand, and a PhD Candidate in Plasma Physics at Princeton University.